A CCTV image of a man has been issued by police investigating an assault on a woman in the east end of Glasgow. The 20-year-old victim was attacked on Turnbull Street at about 20:45 on Wednesday 1 March. Police Scotland said the man shown may have information that could assist them with their inquiries. He is aged about 30, 5ft 10in tall, of medium build and with brown hair. He had a strong Glaswegian accent and smelled of alcohol. 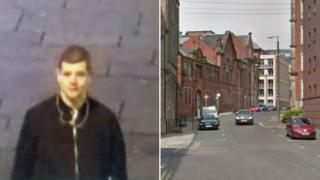 The man was seen in both the city centre and the east end, in particular on Argyle Street, London Road and Turnbull Street. Det Con Raymond Hunter said: "This was a terrifying ordeal for the young woman involved and it is absolutely imperative that we trace the person responsible. "I would like to speak to anyone who may have heard or witnessed a disturbance, or anyone acting suspiciously, in the Turnbull Street area on Wednesday 1 March."